Jon Boden has become the stand out performer of his generation of traditional folk artists, but one whose repertoire extends far beyond the boundaries of the genre. Since 2009 he has performed with his own band The Remnant Kings, performing both traditional folk music and Jon’s own work featured on his second solo album Songs from the Floodplain – a bleak but hopeful view of a post-apocalyptic world, a subject revisited on Afterglow (2017), his first new album after leaving Bellowhead. The Remnant Kings re-formed in July 2017 in an expanded 10 piece line-up to debut Afterglow at Cambridge Folk Festival. The links between a speculative regressed future and folk music was something further explored in BBC Radio 3’s The Essay. 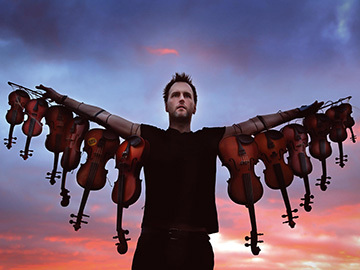 In addition, within the traditional folk scene, he has played in a duo with fellow Bellowhead member John Spiers for over a decade. Throughout Jon’s folk music there is a commitment to social singing and he’s actively promoted this via his involvement in Royal Traditions and Soundpost, two Sheffield based organisations. In addition from 24th June (Midsummer’s Day) 2010 for one year, he undertook an ambitious project called A Folk Song A Day where he released a song every day, the tracks later compiled into monthly albums. Jon Boden shared a link. Jon Boden shared a post.